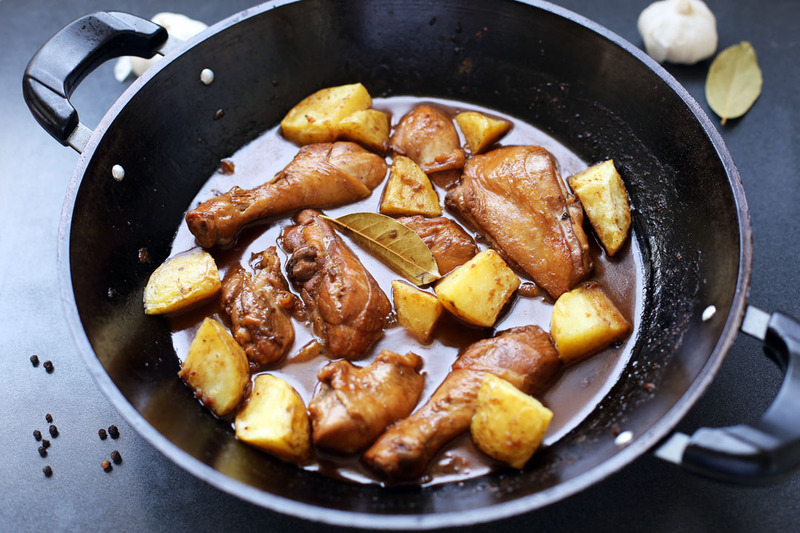 Adobo is a term to define food items in the Philippines where meat or vegetables are stewed in a mixture of vinegar, soy sauce, spices and lots of garlic. Several dishes are cooked in this manner like the Pork Adobo, Chicken Adobo, Adobong Sitaw and Adobong Kangkong to name some. Most of the ingredients and techniques are the same across all of the different adobo variants except for this dish where coconut milk or milk is introduced. This type adobo is the Bicolano version of the most popular Philippine dish where meats are cooked the adobo way but finished with coconut milk and chillies which is a Bicolano dish staple. When I first heard of this dish I was sceptical as it is hard to imagine mixing the salty and sour flavours with the creamy coconut milk but to my surprise it just works, the flavour combination blends really well and the coconut milk mellows down the saltiness and acidity of this already wonderful dish. Add water, vinegar, soy sauce, peppercorn, bay leaves and sugar then bring to a boil and simmer for 25 minutes. Drain and reserve the liquid, in a separate frying pan add oil and fry the drained meat in high heat browning the sides. Mix coconut milk and the drained liquid together then pour the mixture in the pan. Add chillies (depends on the hotness you want) then simmer for additional 5 minutes. Serve topped with fried garlic you separated on step 1. You had my attention after I read that this dish has a whole head of garlic. Yum! About how much sugar do you add? Do you use palm sugar? Looks like a great new way to make chicken for me! This dish is one of my many ” Favorite ” Filipino – Bicolano dishes… I grew up eating this dish. Both my Father and Mother cooked this dish at home and taught me how to make it. This is one of many Comfort Foods. Ang SARAP talaga! I’ve always wondered what adobo meant as I’ve seen many dishes described as adobo something… Now I know! So thanks for that. And as a lover of all things coconut, I quite like the addition of coconut cream. Sounds and looks so delicious! What kind of vinegar did you use in the dish? I’m going to find coconut vinegar… I never knew it existed however, it makes complete sense. Thanks Raymund! I remember that I found the adobo we made a bit too salty for my liking, I bet this one would solve that issue. (Although Mr. N will still prefer the more salty flavored adobo.) That roasted garlic is really killing me though. Yum! It looks and sounds like an excellent flavor combination! I love anything with coconut milk in it! I remember being a young bride wanting to make an impression on friends: pork adobo for some odd reason was the first dish I cooked! Have to resurrect it tho’ perhaps I’ll x-change coconut milk for the cream and feel less sinful 🙂 ! What can I say? Extra rice, please! I love all versions of Adobo! I have heard that term adobo so many times but didn’t know what it meant! I have got to try adobo! Between you and Ray I’ve become quite curious as to how it taste. It certainly looks delicious! Love <3 adobo to the MAX! Hahaha! I like it with gata or no gata…I'm such an adobo person! And I know you always post reliable recipes, so I am going to save this one and try it one of these days! 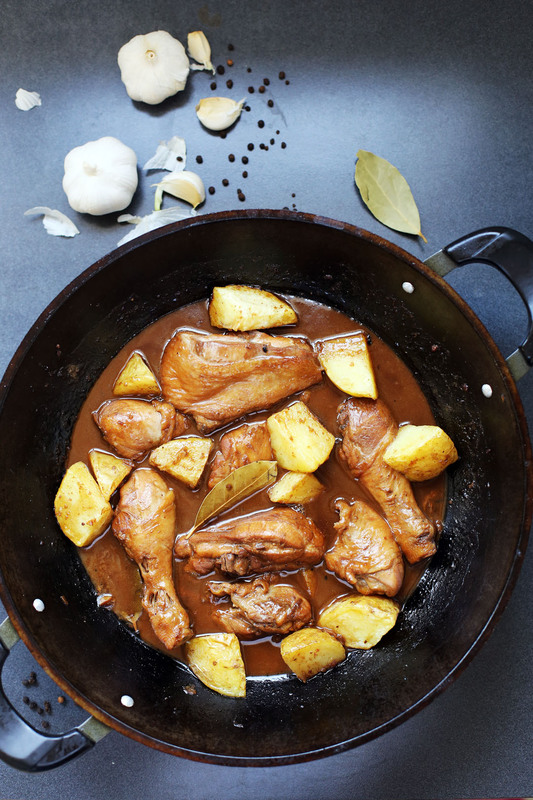 I’ve never had Adobo before — and this looks so delish! Can I use datu puti for the vinegar? What exactly is coconut cream? Can I use coconut milk instead? Yes you can use datu puti and coconut milk, coconut cream is just like “kakang gata” which has richer taste and thicker consistency. I used coconut milk in can and I think I may have overdone it. I made a bigger batch and I might have put more coconut milk than what’s needed because the coconut milk taste was too strong. I’ll try this recipe again, and I’m going to stick to your measurements. Thank you. Just take note since this is adobo sa gata it will taste like coconut milk but it should be 50:50 with the adobo taste. i like 2 c0ok n0w adb0ng my gata. ano po kaya ang magandang gulay na isahog dito? salamat by the way sa recipe na ito. You can fry potatoes and mix it in when everything’s cooked. String beans can be added as well. Hi. When do we return the sauteed garlic which was set aside in step no. 1?